A 21 tonne, right angle shaped, prefabricated concrete panel was being lifted by a tower crane and a mobile crane in a dual lift. As the panel was being lifted into position the panel suddenly dropped. A 21 tonne, right angle shaped, prefabricated concrete panel was being lifted by a tower crane and a mobile crane in a dual lift. The panel was approximately 9.3 metres long by 2.5 metres wide. As the panel was being lifted into position the lifting equipment and/or lifting point failed and the panel suddenly dropped. The reason for the failure is not yet known. A hoist rope was damaged in the incident and the cranes were subjected to shock loading. Debris from the incident landed in a public area next to the site. There were no reported injuries. SafeWork NSW, NSW Police Force, Fire and Rescue NSW and Public Works Engineers responded to the incident. Image: A prefabricated concrete panel that dropped during installation. The site is in Bexley. Work being done at the site is part of the West Connex motorway project. Persons conducting a business or undertaking (PCBUs) are reminded of their duty to identify hazards and manage risks to health and safety in accordance with the provisions of the Work Health and Safety Act 2011 and Work Health and Safety Regulation 2017. Principal Contactors and other businesses working in construction have additional and specific duties under Work Health and Safety (WHS) legislation. Those duties extend to the care of both workers and others – including members of the public. Businesses need to provide and maintain safe plant and structures such as lifts and cranes, and risks related to structures collapsing or objects falling need to be managed.. The loads applied to prefabricated concrete elements during lifting depend on many factors. These include the orientation of the concrete element, the size and shape of the element and its centre of gravity, the location and capacity of the lifting points, and the lifting equipment and method used. The force applied to a crane and lifting equipment can change a lot during a lift. An erection plan is needed to make sure the crane, lifting equipment and concrete element can withstand the applied loads. The erection plan should be developed in consultation with relevant contractors, including the concrete element prefabricator. It should include drawings that have details on the types and locations of all lifting / bracing / fixing inserts and any component reinforcing. Documents about the erection plan should be available on site. They should specify the erection sequence and orientation, the correct lifting points, clutches and the rigging details/configuration. Lifting inserts and clutches must be compatible with each other - seek advice from the item manufacturer if you are unsure. Cranes with sufficient size to use the specified rigging and sling angles, and capacity to handle the calculated load share, must be used. 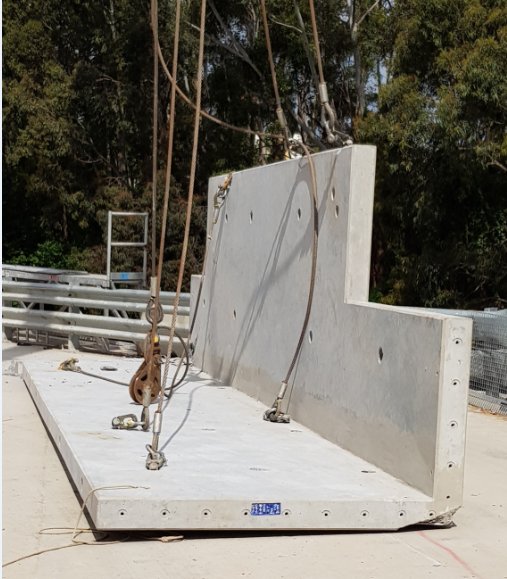 Before lifting anything, make sure the concrete has reached the required strength and the lift can be done as described in the erection plan. Do not deviate from the erection plan, without agreement of the erection designer. AS 3850.1-2015 Prefabricated concrete elements - General requirements. AS 3850.2-2015 Prefabricated concrete elements - Building construction. We have issued this information to draw attention to the occurrence of a serious incident in the construction industry. Investigations are ongoing and further information may be published as it becomes available.